What do you want to activate? Is your new service postpaid or prepaid? 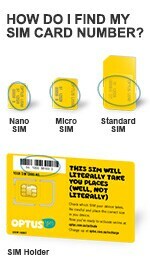 Are you able to send and receive SMS on with your old SIM? you by email or SMS. Hint: If you have a Mobile Broadband device that is unable to receive SMS, please select "No"
Select "Settings" under your old service. Go to "Activate Replacement Sim". Click on "Activate" and follow the prompts. Need help setting up your mobile? Check your bills, usage, set up alerts and much more. Learn about our roaming rates and travel packs. Our Help and Support Page can assist with a wide range of queries. Optus Business Reports is a free online tool, designed to help you easily reconcile bills. The SMB Account service team is on hand 7am-7pm Mon-Fri and 9am-5pm Sat AEST.